The Adult Critical Care Nurses Certification is a way for nurses to provide tangible proof of their skill and expertise in caring for acutely/critically ill adult patients. In preparing for the test and the renewals every three years, you will maintain the most up-to-date knowledge about best practices in this important field of care. 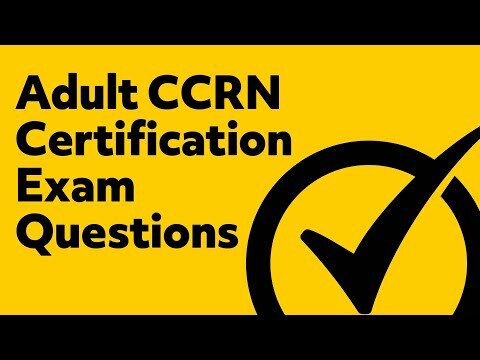 How Can I Register for the CCRN Exam? The exam is only available to those who meet certain eligibility criteria. So you will first have to verify that you meet those criteria. Then, once you’ve received an approval-to-test email, you can schedule your exam and pay the $340 exam fee ($235 for members of the American Association of Critical Care Nurses). Have spent 2,000 hours in direct care of critically ill adult patients within the last five years. When you schedule your AACN CCRN exam, you will be able to select any date you wish. Exams are offered daily, Monday through Saturday, beginning at either 9am or 1:30pm. Testing centers are available at over 300 locations across the United States. The exam is computer-based and timed. You will have three hours to answer 150 questions. 125 questions are scored while 25 are unscored. The unscored questions won’t be marked, however, so you should do your best to answer correctly on all 150 questions. On the day of the test, you shouldn’t bring anything except your valid, photo ID in order to check in. You will not be allowed to eat or drink on the premises and you will not be allowed to bring any personal items into the exam room. Get a good night’s rest and wake up early enough to eat a full breakfast so that you won’t be hungry during the exam. Bring a light sweater or jacket that you can put on or take off as needed during the test. Arrive 15-30 minutes early to check in and get acclimated to the environment. Which Subjects Will Be Covered? The content is entirely based on the American Association of Critical Care Nurses (AACN) Synergy Model for Patient Care. So you need to be familiar with this framework and procedures. Clinical inquiry When Will I Find Out If I Passed? The current minimum cutoff score is 87. That is, you must answer at least 87 out of the 125 scored questions correctly in order to pass and receive certification. You will get your score report immediately after taking the test. Bear in mind that only 79% of candidates pass the test on their first attempt—meaning there’s a 21% chance you won’t pass the first time around. Avoid paying for retakes by scheduling your exam so that you have at least 4-8 weeks to prepare. How Should I Study for the CCRN Exam? The AACN provides an exam handbook that contains an extensive list of the references that were used in the creation of the exam questions. In lieu of reading hundreds of textbooks and reference texts, get a concise yet thorough overview of every topic you will need to know in the Mometrix Study Guide. This guide has been extensively researched and carefully put together so that you get the clear and detailed explanations you need without having to sift through thousands of pages to find them. Combine their expert-crafted study guide with the Mometrix flashcards for a complete study system that will ensure your chances of passing on the first try. These flashcards include key concepts, correct procedures, and best practices. Plus, they are perfect for fitting study time into the hectic schedule of a nurse. Whenever you have a few minutes of down time, you can pull them out and do a little review. What does the CCRN stand for? CCRN is a certification for Critical Care Registered Nurse. This certification shows that a registered nurse has met the requirements to be a critical care nurse for critical or acute adult, pediatric, or neonatal patients. What is on the CCRN exam? The CCRN exam contains two subject areas: Clinical Judgment and Professional Caring and Ethical Practice. What do you have to score on the CCRN to pass? If you take the CCRN Adult exam or the CCRN Pediatric and Neonatal exam, the minimum score you would need to pass is 89. What do you have to do to become a critical care nurse? To become a critical care nurse, you are first required to be a registered nurse. Once you have become a registered nurse, you can ask for assignments that will help you to gain experience and skills in the critical care nursing branch. Many employers require that you have between 1 to 2 years of experience in critical care. How much does it cost to take the CCRN adult exam? If you are an AACN member, the CCRN exam costs $235. If you are not a member, the cost to take the CCRN is $340. How long does it take to get the CCRN scores? When you take the CCRN by computer, you will receive your score results immediately upon completing the test. If you choose to take the exam by paper and pencil, you will receive your scores three to four weeks after completing the test. How long do you have to wait before you can retake a CCRN exam? If you need to retake the CCRN exam, you can sit for the exam up to four times within a 12 month period. How many questions are on the CCRN Adult test? The CCRN Adult exam contains 150 questions; 125 of which are scored and 25 are unscored. Mometrix Academy is a completely free CCRN review resource provided by Mometrix Test Preparation. If you find benefit from our efforts here, check out our premium CCRN study guide or CCRN flashcards to take your studying to the next level. Just click the CCRN Adult study guide link below. Your purchase also helps us make even more great, free CCRN test content for test-takers. Our customers love the tutorial videos from Mometrix Academy that we have incorporated into our CCRN Adult study guide. The CCRN Adult study guide reviews below are examples of customer experiences. I really like the way it’s organized and how the chapters are laid out. Working a full time job, being a mother leaves me little time to study, that is why I appreciate the clear concise information. This book is very easy to read and understand. It is clear and concise. I feel it has really been preparing me for the CCRN exam. This book is awesome..its very easy to read and its straight to the point. I will tell all the nurses in my unit about this book. Great information! Your product helps you organize the material. It helps break up the study subjects in bite size pieces. The tests are VERY helpful. The book is very compact, so I take it every with me. When I have a free moment, (for example, waiting for appointment) I can pull my book out to study. The Adult CCRN Exam Secrets Study Guide is the answer to all of your CCRN questions in preparation for the exam. The study guide covers all systems and explains them thoroughly. This guide along with the flashcards are the perfect pair for studying for the CCRN exam. The practice test at the end are also very helpful. I had a few nurses, who had just taken the test recently, look over the book and they told me it was “awesome.” Highly recommended! The Product works great. I use it to read while have periods of downtime at the hospital. The easy to manage sections make the organization logical and easy to find/follow. The Mometrix Test Preparation for the Adult CCRN Exam has been a great review of ICU material that I already know. This study guide has broken down information into easy-to-study topics. I’ve only read good reviews, I’m looking forward to reading through the book in preparation for the pediatric CCRN exam. Learn more about the Mometrix CCRN Adult Exam Secrets Study Guide. 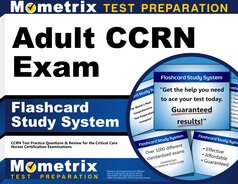 Learn more about the Mometrix CCRN Adult Exam Flashcards.